It's that time of year again - the Blogger's Quilt Festival. This time around I'm "entering" my Dazzling Diamonds quilt. This was a hard choice for me because I've actually finished quite a few quilts this year. I made this quilt as part of a challenge the Boston Modern Quilt Guild was hosting. 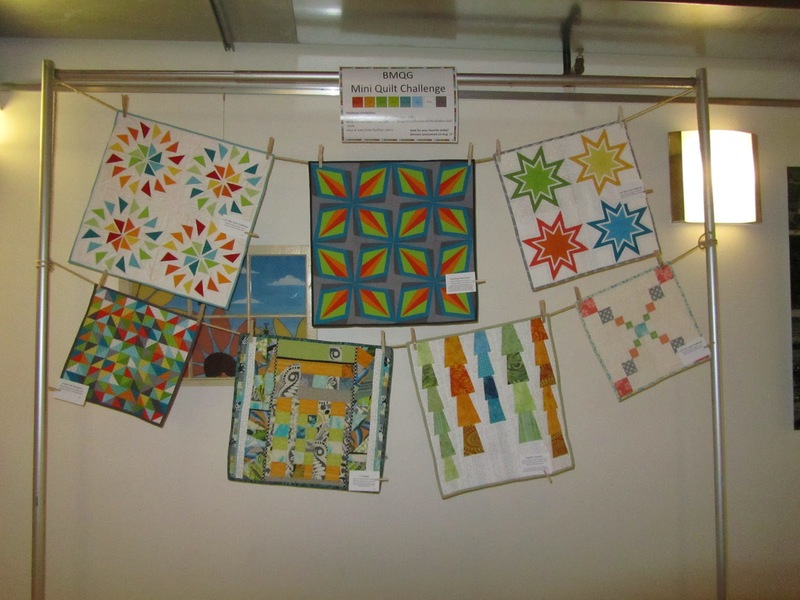 Participants had to make a mini quilt in the colors of QuiltCon. The mini had to use at least three of the colors and could be no bigger than 24" on any side. Anyone who knows me well knows that I love to paper piece. 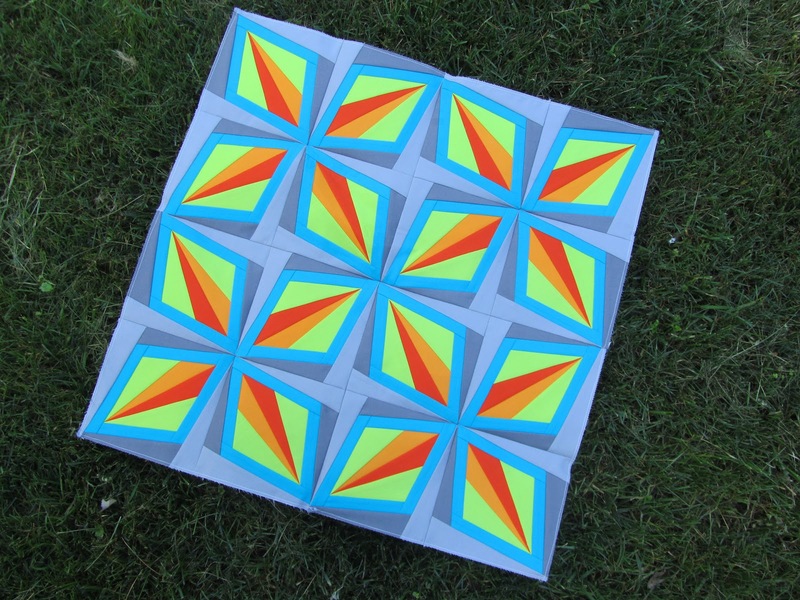 So of course I needed to create my own paper pieced pattern for my entry into the challenge. I designed this block because I wanted a block with diamonds, but with a slight twist. The quilt went together pretty easy. The great thing about the block is that there's only one point to match, the tip of the diamonds, which is pretty rare for a lot of paper pieced patterns. I think this also went together easy for me because I had just finished piecing the 140th paper pieced block in a different (but secret) quilt that I've been working on. 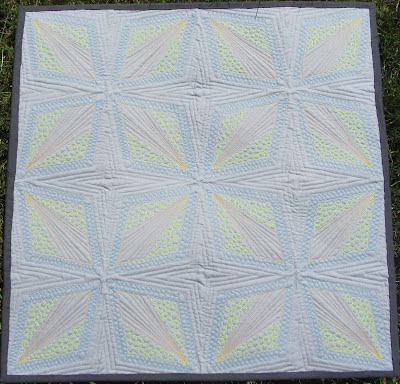 16 blocks in this quilt seemed like a piece of cake! I love how in using two different grey fabrics for the stars, a secondary pattern emerged, a dark grey pinwheel. 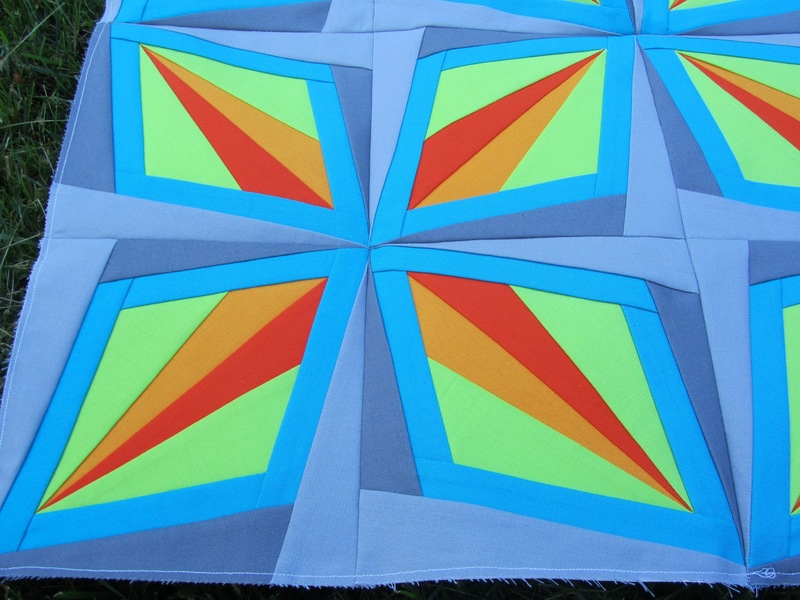 I also love two different stars that emerge when piecing multiple blocks together - the grey and the orange in this quilt. I lamented for a while on how I should quilt this beauty. 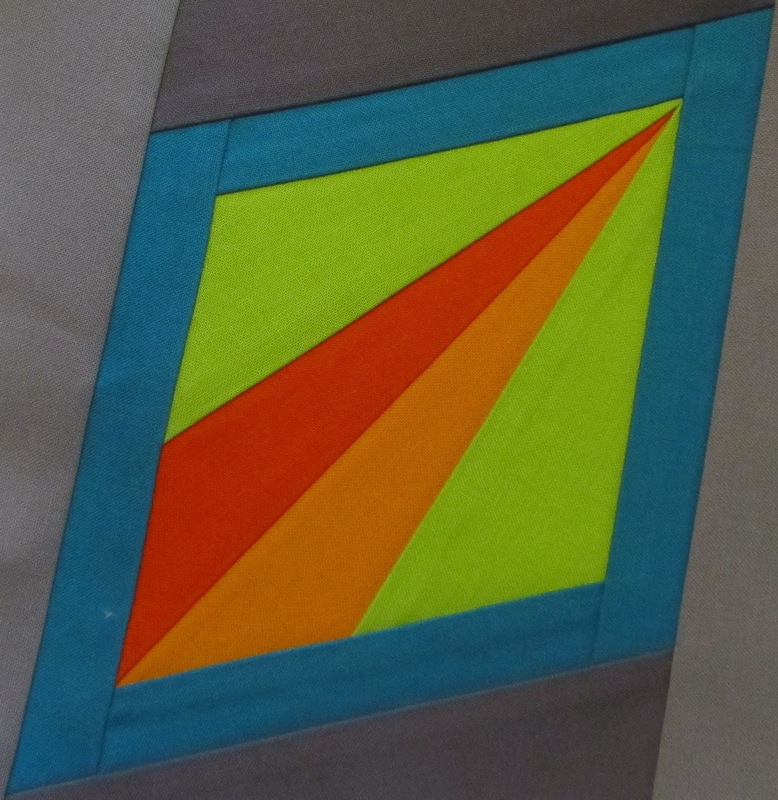 I knew I needed to do some custom quilting, but what kind of quilting should I do? I started by echo quilting in the grey stars. I stitched in the ditch around the blue diamonds and did a 1/4" echo three times within the grey stars. I then did some pebble quilting in the lime background. I knew I wanted to do a figure eight type design in the blue, but I wasn't sure if I could do it well enough in such a narrow space. The blue diamonds do measure only about 1/2" wide. After practicing on some scrap fabric sandwiches, I realized that I could do a figure eight pretty well in the space provided, so I went for it. I have to say, I'm really pleased with how it turned out. I really like to practice new quilting designs on scrap quilt sandwiches first before digging into a quilt. Boy am I glad I did. The first few tries left me thinking that the blue would either be left unquilted or with a more simple design. Practice is key because, like I said, I really like how it turned out and that might be my favorite part of the quilting. I finished up by quilting some radiating straight lines in the orange star points to highlight the motion of the star. I did change my thread color for each section for four different color threads. Because of that, the back looks like an awesome whole cloth quilt. Am I the only one who loves to just run my hands across a finish quilted quilt? I couldn't stop running my hands over this one. I bound the quilt in a charcoal Kona to really frame the quilt. Overall, I'm really pleased with how this quilt turned out and it has become one of my new favorite quilts. Of course, that will probably change when I finish another quilt. I'll be teaching a class on this quilt on November 18th at Quilter's Way in Concord, MA if you're interested in making your own mini quilt wall hanging or table topper for the holidays. 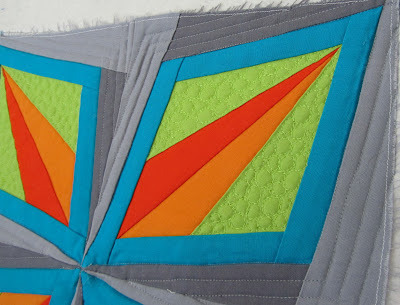 You can check out the rest of the quilts in the BMQG challenge here. Amazing, aren't they? Pattern: Dazzling Diamonds by me! Machine paper pieced and machine quilted by me using Superior Threads So Fine! I smile everytime I walk in to Quilter's Way and see this:-) Beautiful, you did an amazing job!!! 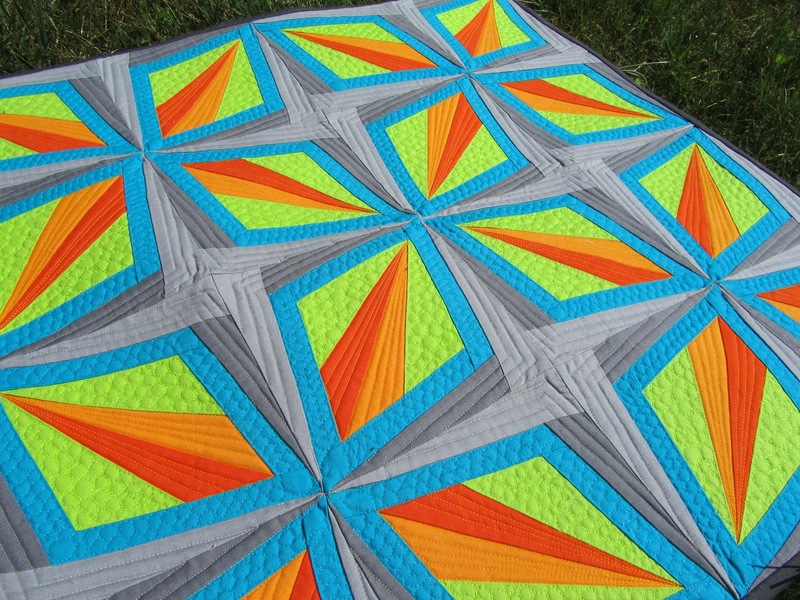 Great colours and awesome quilting! Love it! Oh, I love solids. And I love your quilt! Really beautiful! 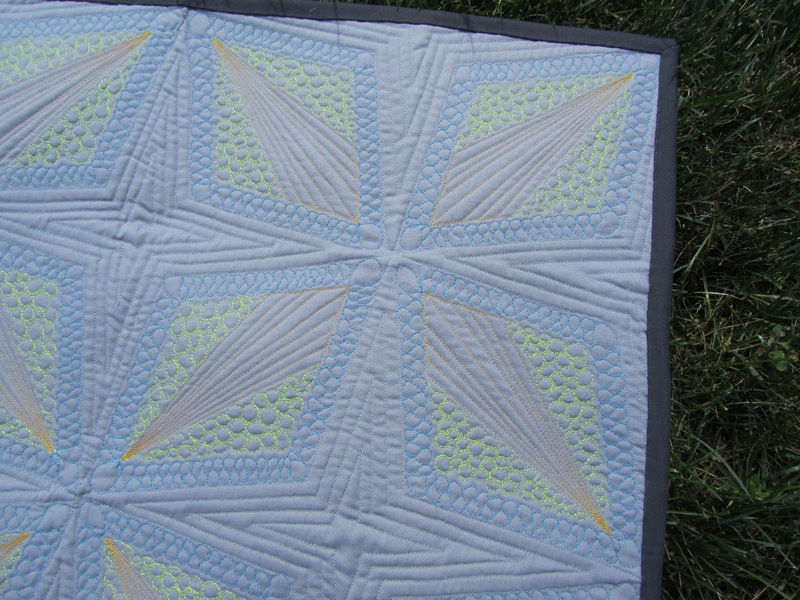 Amazing quilting and I love the block design! Thanks for sharing! This is glorious. The colors just glow! I love how the colors pop in this quilt! Dazzling is right! Beautiful!! It has so much movement - very dynamic. 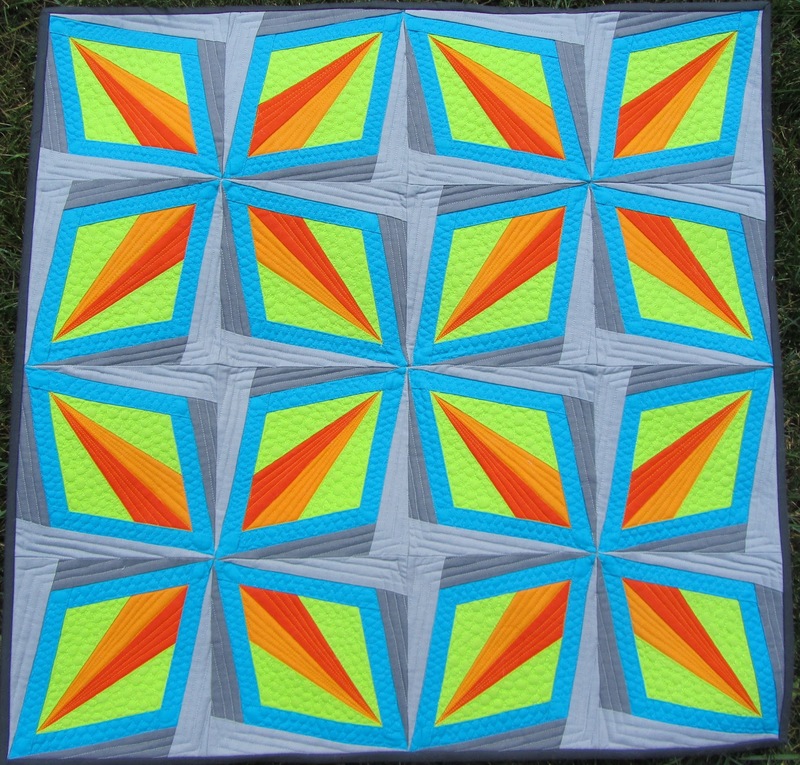 WOW what a glowing quilt-love it! Stunning quilt - love the colours and your quilting is amazing! Love it! Very stunning! Great work! Very bright and wonderful. It cheers up a gray fall day. So pretty, the colors are great and the quilting is amazing! WOW! Amazing! Definitely one of the first BQF entries that caught my eye. Between the colors, pattern and quilting...it is a STUNNING quilt! I envy your figure 8s. I have been able to accomplish them..even with pen to paper ;)!!! This is lovely! The grey is the perfect balance to those lovely bright colors! It is lovely, I agree with Candied Fabrics, the grey makes the difference. Well done!!!. Great pattern and use of bold solid colors! 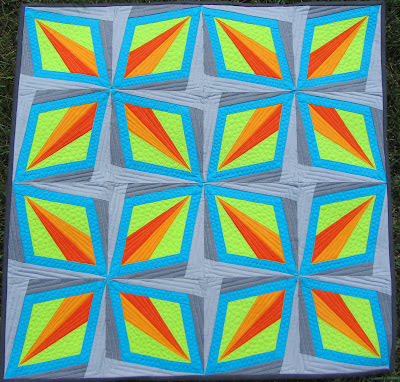 Super quilt - and your quilting is just perfect for it! Very nice! It's hard to believe it is so small. It packs a punch, in a good way. Awesome quilting too! Hey I remember this QuiltCon block! It looks great in a quilt! This was a real eye catcher of a quilt. LOVE it!!!! This quilt is awesome! Love the pattern and that back is amazing! If only I lived in MA! I love your style. Beautiful quilt! 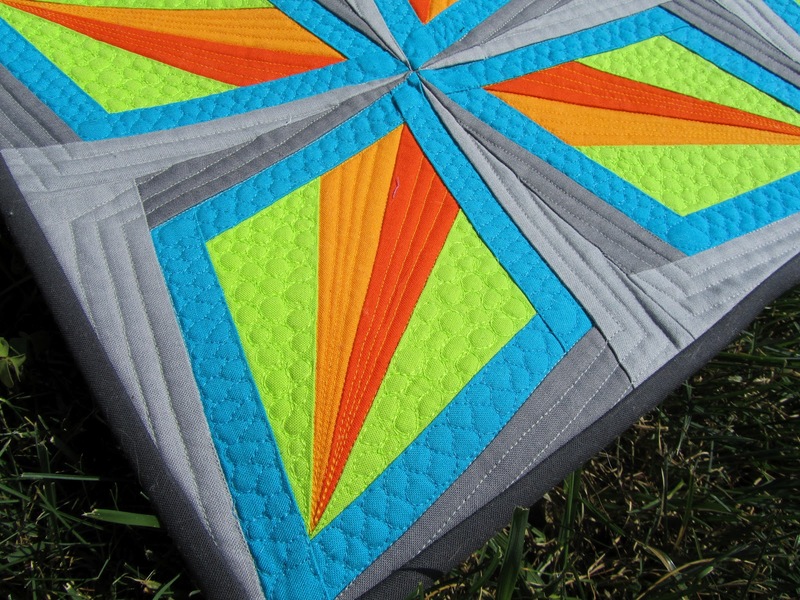 Stunning colors and great quilting! I LOVE this! Love the colours, love the design, love the quilting. Great job! The quilting really makes everything pop and the secondary designs make everything else feel like it's moving. Your quilt is stunning. Beautiful use of the colours in your design. I love the way you have chosen to quilt it. This is amazingly beautiful. I love the colors, the quilting, the pattern. You did a fabulous job.